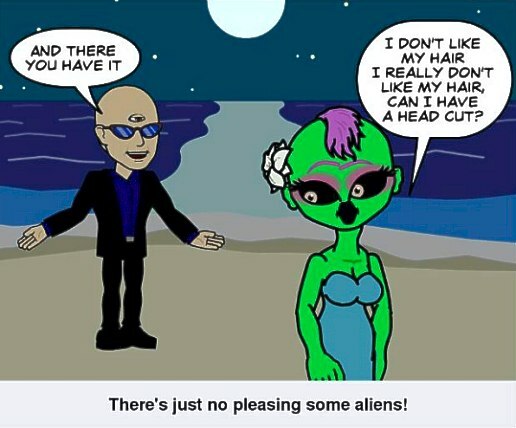 Bitstrips is an App available on Facebook and Twitter, which enables you to create cartoon avatars. You can create as many as you like if you have alternative profiles or friends that don’t mind you mutating them. Each day the App offers four cartoon scenes in which your character appears with ‘co-stars’. Their posture and what they are saying is up to you. 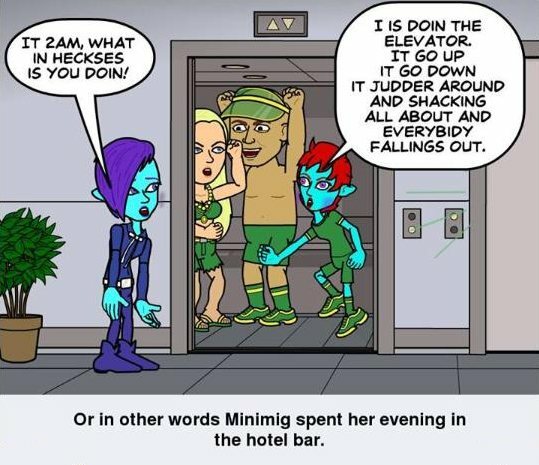 A typical example is two of my alien characters – Minimig and Nipkin, who are fairy-like creatures. They don’t completely understand humans and our strange ways, so when they are transported back in time (2013 to be exact), to the human homework, life presents some problems. My readers enjoy seeing the characters in various misunderstood and crazy situations, it keeps them in the ’loop’ between publishing novels and attracts new readers, who wonder what the heck these two idiots are about. Hey where would Spiderman be without cartoons! The App has its limitations. I can’t include some of the ’narravac’ (fairy-ish) features like wings and tentacles. 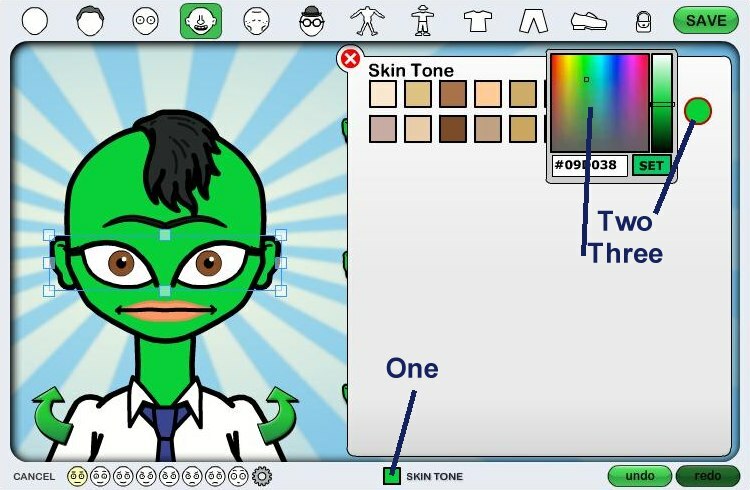 However, the avatar creating functions can be tweaked to create any color skin, distorted shaped ears, head or larger than life eyes etc. 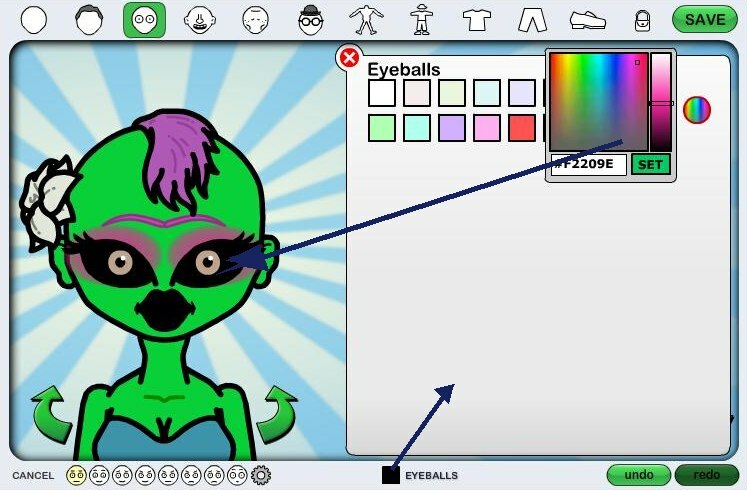 If you’d like to give it a try here are some tips and functions that few Bitstrip users ever make use of. By left clicking on the upper and lower portions of the face an editing box will appear. With this you can change face and feature shape above and beyond the offered options. The front view will allow you to alter size of eyes, lips, eyebrows and their position. It can get pretty weird! Remember to rotate the head and adjust perspective accordingly, so side views compliment the front view. Here you can stretch the ears and nose or completely remove them by dragging such off the head and away from the editing window. Click on the skin until a box appears at center bottom titled ‘Skin Tone’. Click on the box (One) and a chart will appear. On the right side of the chart you will see a circle (Two), click on that and you are offered the whole spectrum of colors (Three). The bar will adjust darkness of the color. Lets try a green. You can use this option to change the color of hair, lips, eye features, clothes etc, by clicking on these features and then the center bottom box to bring up color charts. Then its just a matter of selecting clothes, hair style, body shape etc. Have fun, remind readers of your work without spamming and expand your audience. This article was written by Phoenix MacKenzie, a fantasy and scifi writer.